It’s Friday and it’s August. That sounds like great start to the new month to me! I hope you have a good weekend planned too! Anchors away is orange yellow – almost mustardy – colour. It is bright and shiny and actually quite beautiful. I didn’t expect to like it but I love it! It helps that it is a gorgeous formula. This is 2 coats with no topcoat. Super opaque and not a streak or struggle in sight. Really, for a yellow this is a big win. Nice creamy formula and great application. One of my favourites because of the great formula and fun bright colour. Big daddy is a bright orange with a red tone. This is 3 coats with no topcoat. See that shine? It’s really pretty. Great formula, great application. It’s actually quite beautiful and for me, a perfect summery shade. I was a little worried on the first coat that it would stay sheer but it built up beautifully. 2 coats might be enough for some (or a base for nail art) but I preferred 3 coats. This is a beautiful coral leaning a bit more red. This is 2 coats with no topcoat. Even though the colour is really beautiful you are treated to an extra dose of pretty. This is packed with a blue / violet shimmer that I didn’t notice until I applied it. It is a bit subtle so you won’t be blinding people with shimmer but it is definitely noticeable and oh so gorgeous. I actually really love that the shimmer is blue / violet and contrasting with the coral base. It really makes this polish shine. Great formula and good opacity. Embers only is a bright, cherry tomato crelly with a beautiful pink shimmer. It also has some larger pink and holo gold glitter in there that is quite gorgeous. This is 2 coats with no topcoat. Formula is great and slightly thin. Even though the opacity is great you might feel inclined to add a third coat. Partly because of the thin (but trouble free) formula and party to get more of that sparse bigger glitter on there. This is actually so beautiful and sparkly. I love the brightness and that it is true cherry red. This is an interesting one. It’s a brick red metallic with micro and small holo glitter. It is also a texture. This is 2 coats with no topcoat. It isn’t super textured which at first had me a little disappointed but after wearing it I actually like it. If you are unsure about liking texture this is definitely a good one to start with. It is also really easy to add topcoat and smooth it out because it would probably only need one coat of topcoat. It’s definitely a unique colour to my collection and I think its great for winter / autumn. I like it. You guys! Look at it! This ia a berry red with red glitter and also textured. It is the same texture as Hot chili, which means not much at all. This is 2 coats with no topcoat. Great formula and great opacity. It is actually quite beautiful but the stand out for me was while it was still wet. My heart skipped a beat when I saw it. Let me show you. Is that not the most beautiful thing? The red glitter in this with the berry red base is perfection in my book. I just needed one coat of topcoat to smooth it out. I LOVE this polish. If you, like me, think that China Glaze – Ruby pumps is the most beautiful red polish ever made then I know you are thinking this looks like it might be similar. I had the same though so for our convenience, I am throwing in a comparison. Comparison: Sinful Colors – Ruby glisten vs China Glaze – Ruby pumps. Can you see which is which? There is a slight difference. Ruby pumps has more red glitter than Ruby glisten. The glitter in Ruby pumps is also a bit more red than in Ruby glisten. I do think that if you didn’t have them next to each other the difference wouldn’t be as obvious. 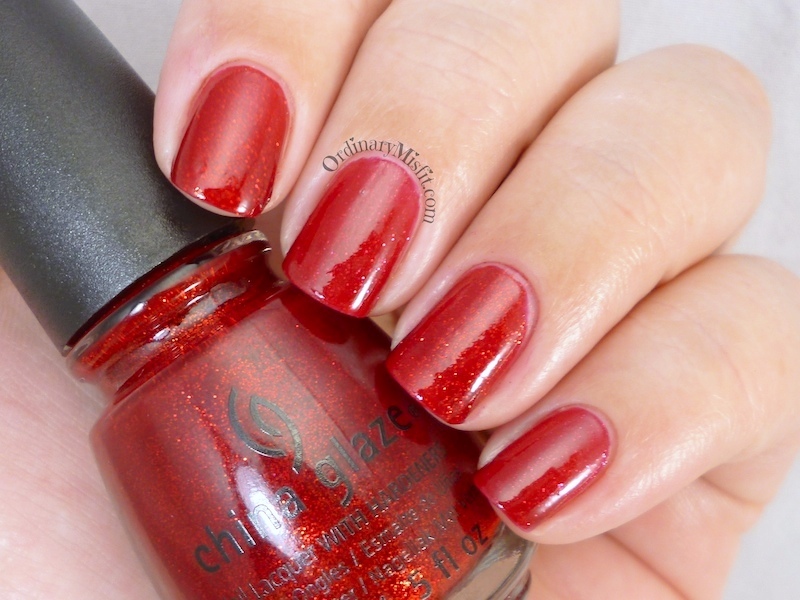 I know China Glaze – Ruby pumps is sometimes a little harder to find so if you have been on the hunt for it then Ruby glisten is a nice alternative. Even though not the same, it is beautiful and I am happy to have both. I just needed one coat of topcoat on Ruby glisten to smooth it out. Sinful Colors – Gold medal. I also bought this polish from this collection but unfortunately I once again ended up with a dud bottle. I tried to fix it as best I could but in the end I couldn’t even open my bottle. I will try to get another bottle or at the very least try and find a bottle to transfer it to. I am so disappointed because I was looking forward to seeing it. I have such a thing about people opening bottles in store and even worse when people ‘test’ polish in store. When I bought these there was a lady next to me that was picking up random bottles and trying them on and then – shock horror – stole some remover to remove and try more. I despise people who do that because they almost never buy every single polish they open / test. Then people like me end up buying these used, dodgy polishes. Stop it people! It is NOT cool. We don’t go around testing food in grocery stores or eye shadow etc so stop ‘stealing’ polish. Ok, rant over. So, what do you think? If you are a red lover then I think this is a treat collection for you. I just said the other day I don’t have many reds and look at this. 🙂 I also really loved Anchors away. Ok all of them are pretty. Which one is your favourite? Have a lovely weekend and be safe! I really love Embers Only! And I so agree with you about people ‘testing’ the polishes! If you want to know how it looks look up a swatch… this is why there are so many of us blogging about nails! Luckily I haven’t gotten such a disaster bottle yet but I know I’ll be furious if it happens to me. Embers only is gorgeous. It is a stunning shade of red and the glitter. LOVE. I know right, it’s damn annoying. I’ve had quite a few bad bottles and I know it is because I reuse to open them till they are paid for but I think I need to at least start checking the brushes. gah! Anchors Away does look nice on you…although I would fear it on myself, haha. The shimmer in Big Daddy is interesting and Ruby Glisten is quite lovely. And definitely a big, giant, mega BOO to people testing products in stores! NO! This is actually a big reason why I don’t shop cosmetics at Wal-Mart here. Their beauty department is always THRASHED and I have physically seen a woman trying on make-up and putting it back there more than once. There are a few brands only carried there, but I’m just like NOPE, I’ll skip ’em! Ew.